Having obtained the signal-to-noise ratios required for analyses of single-subject, non-trial-averaged time-series, we are now working to be able to use a single patient’s neuroimaging data to derive his or her own parameters that can be incorporated within a subject-specific computational brain model. The advantage of having such a model is that one can, in principle, then feed it any set of new inputs, and thus simulate how the brain’s current dynamical state will evolve over minutes, hours, months, and possibly even (to some degree) years and decades. We are currently developing this approach in several ongoing projects, sponsored by the U.S. National Institutes of Health, National Science Foundation, and the National Academies of Science Keck Futures Initiative. The first, focusing this time on a slightly different control circuit, probes the dynamic process of cravings, drug-seeking behavior, satiety, and renewed cravings in drug addiction. Nicotine is the most common drug of abuse in the United States, and has addiction strength comparable to cocaine, heroin, and alcohol. It is the primary addictive component of tobacco, and its use markedly increases risk for cancer, heart disease, asthma, miscarriage, and infant mortality. Addiction is thought to be caused primarily by the intersection of two components: the impact of drug pharmacokinetics on the dynamics of dopamine (DA) response, and dysregulation of the brain’s reward circuit, composed broadly of the cortico-striatal loop that includes the nucleus accumbens, ventral tegmental area, caudate, and orbitofrontal cortex. Subjects are first required to abstain from cigarettes for 12 hours, after which they face intense cravings. Once in the scanner, subject are then permitted to “smoke” (using instrumentation that we developed), but the addict is asked to delay each puff as long as he or she possibly can. We then use individual subjects’ neuroimaging data to derive coupled differential equations for a control system that predicts craving and behavioral response trajectories for that individual. Using independent data sets to estimate the parameters and to test them, we hypothesize that control systems regulation will predict an individual subject’s cravings, as measured behaviorally by the frequency at which each smoker self-administers nicotine. Thus, we aim to use brain dynamics to predict exactly when each individual smoker will be compelled to take his or her next puff. This approach would have more general implications for understanding the phenomenon of relapse in addiction. The second study approaches fMRI connectivity as an emergent phenomenon produced by biological constraints imposed at the neuronal, glial, synaptic, and mitochondrial scale. My group, in collaboration with those of Dr. Ken Dill (Director, Laufer Center for Physical and Quantitative Biology) and Dr. Steve Skiena (Professor, Computer Science) together are integrating human neuroimaging data with multi-scale computational modeling in order to test hypotheses with respect to how energy constraints (from diet to mitochondria) affect brain functioning. This study includes four components. First, the project uses animal data to adapt biomimetic neuron models to include energy constraints. Second, the project generates human data for network reorganization in response to changes in energy supply and demand in a sample of human subjects with varying baseline glycemic loads (glucogenic, glycogenic, ketogenic) and in response to glucose bolus administered during the scan. Next, as a first step towards integrating models with fMRI data, models are adapted to include neurovascular coupling as well as parameters for single-subject variability in metabolism, energy demand, and energy supply. 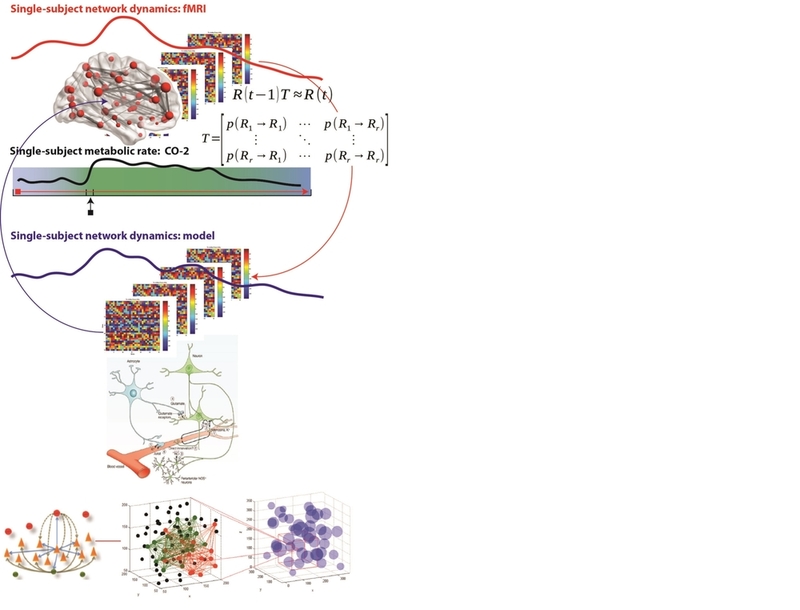 Finally, the model—now fully integrated across scales—will be used to make predictions, based upon single-subject-specific parameters, for emergent properties in the form of dynamic graphs at the connectivity scale. These will be compared against network trajectories acquired from fMRI data. Using an iterative approach, in which human data provide feedback, informing the models, which then make predictions that are tested against the next individual’s data, models will eventually converge in predicting human network trajectories based upon individually variable parameters. If successful, the project would culminate in a platform that not only, in its own right, provides fundamentally new and important scientific knowledge about the relationship between diet and human brain function but—even more critically—can be adapted and expanded by a larger community of researchers to include other biological constraints as well.